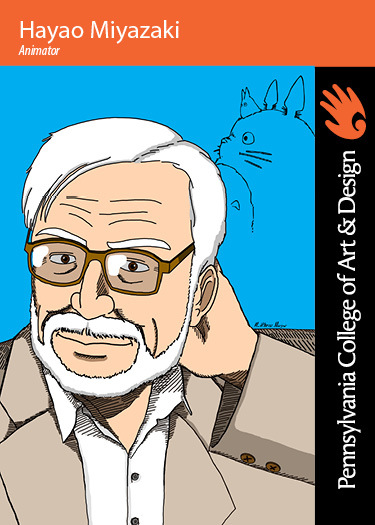 As a director, producer, animator, and storyteller, Hayao Miyazaki was the leader of one of the most successful animated motion picture studios in the world, Studio Ghibli. The studio surfaced out of his success with the motion picture, Nausicaa of the Valley of the Wind. With constant themes of man vs. nature, and an endless supply of colorful characters, Miyazaki’s creations have been shared throughout the world—eventually leading to a 2003 Oscar win for Best Animated Picture, Spirited Away. Miyazaki’s works are beyond compare, except perhaps to each other. They certainly stand as some of the best the animation genre has to offer. On January 14, 1998, Miyazaki announced he would be leaving Studio Ghibli, as he could no longer guarantee high quality art due to his failing eyesight. That “step down” didn’t last long however, as he returned the following year, taking a strong role in asserting organizational discipline and focusing employees on their tasks. It appears Miyazaki’s love and connection to animation is even stronger than he, himself, understands. Miyazaki uses traditional animation with human-like movements in his work. Most of his art is done using watercolor. He began his animation career in 1963, when he joined the Japanese animation studio—Toei Animation. Miyazaki also illustrated a few manga (Japanese comics), including Nausicaa of the Valley of the Wind, which is adapted into a full-length film. He won multiple awards, including an Academy Award for Best Animated feature for Spirited Away. Miyazaki’s works are often compared to other animators and film directors like Walt Disney, Nick Park, and Steven Spielberg.